These hearty layered quesadillas are the Tex-Mex version of a deli counter favorite: the turkey BLT club sandwich. Layer first 5 ingredients on tortillas; fold in half. Heat large nonstick skillet on medium heat. 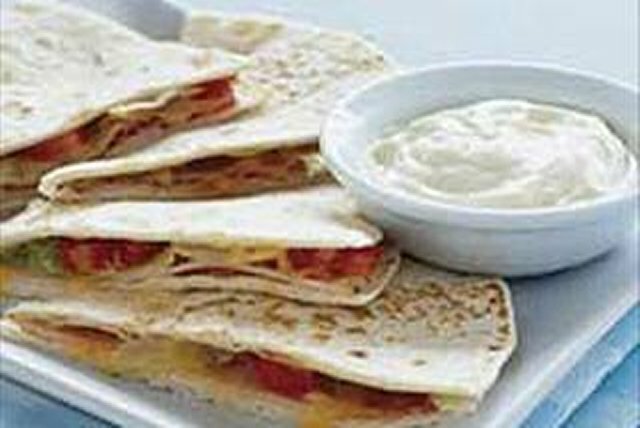 Add quesadillas, 2 at a time; cook 2 to 3 min. on each side or until lightly browned on both sides. Cut into wedges. Serve with fresh fruit to round out the meal. An opened bag of KRAFT Shredded Cheese can be sealed and stored in the freezer - no need to thaw before using as directed in your favorite cooked or baked recipe. Use KRAFT Mayo Chipotle Flavored Reduced Fat Mayonnaise.